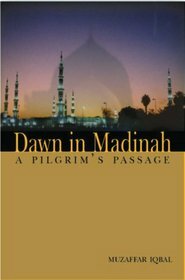 At the moment I am reading this beautiful book titled, Dawn in Madinah: A pilgrim's passage, authored by Muzaffar Iqbal, may Allah bless him. Its one of the most delightful read for me in the span of last few months. Its a spiritual diary of a man who had the call to spend the entire month of Ramadan as a retreat in one of the most blessed sanctuary of Islam, Madinah, where the Prophet established his Community of Believers and finally breathed his last as well. Muzaffar Iqbal returned to Pakistan in 1990 after a decade-long sojourn in the West and like many repatriates, had hopes of contributing to a process of positive change in his country, in the people he loved. He was part of OIC or Organization of Islamic Conference but very soon he found how the organization is setup to fail both inside and out, he saw the corruption on part of the leadership, corruption of heart and mind. Then when he found his ideals, hopes and principals are betrayed in every aspect, on the afternoon of August in 1996 he resigned from his job at OIC. Protesting at the immoral acts of his higher officials he couldn't accept any more and walked out. It was during those time, like many at certain turning point of life, he also felt the "Dark Night of the Soul," 'felt a deep hollowness - as if .. sinking into an endless void." At a very low point in his life when everything seemed to close upon him,when such state lasted for weeks and months and as time passed, the author became his own prisoner of suffering. Then, one day, in the stillness of the empty house, a command-like volition appeared in his mind: "Go spend a month in the Prophet's mosque in Madinah." To him it appeared from nowhere and within minutes lodged itself in the inner recess of his being with such intensity that he could not think of anything else. This idea was like a luminous spot in the pitch-black darkness. This is the background of the book and then the author followed his inner call and finally found himself at the doorstep of the Prophet's Mosque in Medina after his visit of Kaba in Mecca. He has a gift not only in writing, but also spiritually from where he absorbed the moments beautifully and transmitted them in the pages of this wonderful book. The book is set in very contemporary time and like an important diary written during the time 1997-1998. What is unique about his style is that it is written in a very personal fashion, yet the author has successfully incorporated historical event associated with the places where he was traveling, spent time in retreat and worship. The time of the Prophet becomes alive in his description. His detailed description of the various significant areas of the Mosque of Medina is also very illuminating. For those who have never been to the Prophet's Mosque this could be a beautiful introduction and those who have already been there, this can immensely enrich and refresh their memories. In fact the Book can rekindle the fire of love to be near the memories of the Prophet and to his resting place (hujra). From the introduction of the Book I quote: "Dawn in Madinah: A Pilgrim's Passage is a vivid account of a month long retreat in the Prophet's Mosque in Madinah. The luminous details of this sojourn in Islam's second-most sacred mosque are superimposed upon the historical events that shaped the life of the early Muslim community during its formative period. Numerous episodes from the life of the Prophet form an ever-present backdrop to its narrative which moves across time to weave together the desires, hopes, fears, and spiritual struggles of so many pilgrims present during the month of Ramadan in the Mosque, fourteen hundred and eighteen years after it was built by Prophet Muhammad and his Companions soon after their arrival in Madinah. This juxtaposition of contemporary lives with those lived fourteen centuries ago creates a tapestry in which one can find common threads of a journey toward God. What unites the various strands of the book is the trans-historical spiritual quest of countless individuals who populate this rich narrative.."
One of the reviewer at Amazon writes: "I ordered this book after I attended a public talk given by the author. At the presentation I was struck by the high level of intelligence of the speaker as well as his ability to convey his message to all members of the audience irrespective of their intellectual level. While reading the book, I was taken mentally and spiritually to Medina. I could feel the atmosphere that the author experienced during his time there. It was very inspiring and definitely inspired me to want to make a similar journey myself in the near future." This review captures what I am also feeling while reading the book. 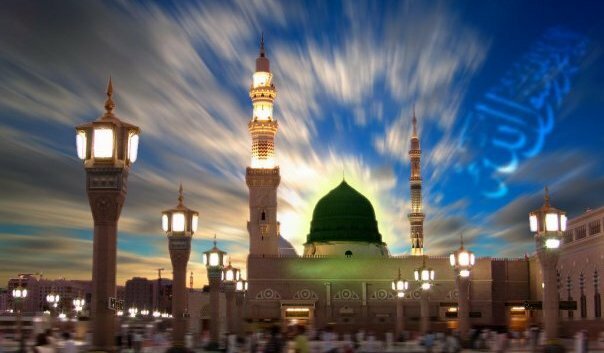 It amazingly takes one mentally and spiritually to Medina, the locus of Love for every Muslim. Perhaps more from this book / this author later, God Willing. [+] You may read selections of this book via Google Book here. I was inspired to pickup the book Dawn in Madinah particularly at the moment in time because recently I received a message from a friend and reader of Technology of the Heart who wrote while being in the Prophet's Mosque. It is an honor to be remembered in those Hearts in which remembrance of the Most High is happening, the Hearts which are loved by Allah. So the friend who was on a similar pilgrimage to the holy sanctuaries of Mecca and Medina was also inspired to share her reflection for the readers of Technology of the Heart. So I am sharing it below. May Allah bless our friend and may Allah accept her and her loved ones visit to the perfumed gardens. When this insignificant speck was sent an unexpected invitation to the 'Land of Dreams' the reality of such an honor could not be acknowledged with reciprocity worthy of such lofty invitation. Until these two unworthy feet touched the blessed earth where the King of all Kings is Most Present, only then I would know that I had arrived.... until then, it was an invitation that I had no guts to accept. It is evidently clear that daily life clouds my dead heart and rob it from its dues. I sincerely pray for Imaan, Deep Faith that does not wax and wane like the passing moon! However, visiting Makkah Shareef, the Holy Sanctuary of Mecca, is a constant reminder, that if your heart is dead, know that the One who can give life to the dead body, can give life to the dead heart...I remained hopeful. With my weak imaan and impure heart, I can only wish to taste the sweetness of reciting His beautiful Labbaik! Fervently hoping that He may purify and make possible for this insignificant soul to partake, in even a mustard seeds worth of pleasure derived from worshiping Him! With my heart so heavy and feeling that everything I desire is so out of reach I proceeded to submit myself to His commands. Umrah (the lesser Pilgrimage to the sanctuary of Mecca) was like a beautiful dream....One that you never ever want to wake up from. The first glance of the Kaabah Shareef was just as heart-rending as the last... May He accept and invite over and over again! Aameen, By Allah so be it. The hustle and bustle of Makkah Shareef is now clouded even more by the sound of cranes and mountains crumbling down. The expansion the new haram is vast and extensive. The pro's and con's can be heavily weighed. The crowds are magnanimous. A thought I continuously expounded on was that Subhaan~Allah, Islam is definitely on the rise. However, a wise woman once shared her thoughts with me regarding the numerous souls that are invited here. She said a common complaint was that you find a place to read salaah and sit there comfortably until the azaan is called out, waiting patiently to be in conversation with your Lord! However, as soon as you stand up to begin supplicating, worshipers began to fill up spaces from all around leaving you wondering how will you ever prostrate with ease. On one occasion when her anger got the better of her, she bellowed out in rage to the lady next to her that she has taken up all her space and how can she pray! The woman turned to her and smiled at her. And taught her a lesson for life. She said ' My dear sister, this is the House of Allah, I have been invited here just like how you have been invited here...When a child is conceived in the womb of a mother, who is it that expands the belly to make space for that growing child...Do not fear for lack of space for there is someone taking of it..." Subhaan~Allah! As soon as Umrah was complete the heart automatically turns its attention to the yearning of sweet, serene, peaceful Medinah Shareef. I immediately started preparing a 'gift' for our Master Nabi Sallalaahu ~Alaihi~ Wasallam. The great gifts and prizes that Allah Subhanahu~ Wa~ Ta'ala has prepared for Nabi Sallalaahu ~Alaihi~ Wasallam have been mentioned in Surah Kauthar (108th chapter of the Quran which was a special gift to the Prophet confirming great reward from the Divine). Usually when we visit someone we take a gift and the best gift to bestow upon Nabi Sallalaahu ~Alaihi~ Wasallam is reciting Surah Kauthar, 1000 times and conferring the reward to our Master. Nabi Sallalaahu ~Alaihi~ Wasallam becomes extremely happy at this gesture of ours. May Allah bless our Master Muhammad and send him peace and increase love for him in our hearts, connect us to his spiritual lineage and his haqaiq. By Allah, so be it. So be it. So be it. Ameen. As one enters the city of Medina Shareef, a feeling of tranquility descends on ones soul, body and mind. It is definitely the city of peace and barakah. There is barakah everywhere and in everything. Time, food, money, sleep and the list is endless. Its a dream world where life is just perfect! When you are in Medinah Shareef and immersed in sea of people, you truly realise your insignificance. You don't even have the understanding of the value of a single durood (salutation and benediction to the Prophet) at that moment. You feel unworthy of standing anywhere and reciting durood and salaam, leave alone in front of the blessed Raudah Mubaruk of Nabi Sallalaahu ~Alaihi~ Wasallam. One pious person said : 'Take the darkness of your sins to the perfect guide'.... Sallalaahu ~Alaihi~ Wasallam.. Solace! Its always easy presenting the good and very difficult presenting the bad. Inshaa~Allah , May Allah Subhanahu ~Wa~ Ta'ala present us our book of deeds in our right hands on that Day and may we enter Jannah with a Peaceful and beautiful Salaaam! Aameen, By Allah, so be it. This sinful soul had the opportunity of stepping into Jannah, into Paradise daily with ease and comfort and although once again the crowds are immense...I was taken from the entrance of the Masjid into Riyaadul Jannah like a wave exiting an ocean. Ya Allah! The feeling of being chosen to be on that 'spot of earth' amongst a handful of people on the entire surface of the earth is irreplaceable! You wish you could sit there forever and die there as well! An interesting analogy that I pondered over in Madinah Shareef was that of Qiyamah, the Awesome Day of Resurrection. Everyone for themselves and each one fighting for a taste of Jannah, Paradise. A young mother hurriedly walking past towards Riyaadul Jannah literally drops her sleeping child beside me and runs off. The stark reality of that 'day', now imprinted in my mind has deposited an meager lump of imaan in this weak heart. We all desire to come back stronger than before. The intention you go with is the cornerstone of what you will come back with. Standing near Mount Uhud and enveloped in the beauty of the mountain, I placed myself on the sandy ground. I lifted a lump of sand to my mouth. I pray to my Allah..."Oh Allah! The mubaruk sands of Medinah have touched the outer part of my body"... I eat the sand and continue.... "Now that it has also touched the inner part of my body, keep me amongst those that have been safeguarded from all harm and bless me with a place in Jannah" Aameen! "Oh Allah! These very same impure eyes that are looking the moon above from the ground beneath...give them an opportunity to view this very same moon from this very same spot again" Fee-amaanillah! Qur'aan is truth. Sunnah is truth. Hadith is truth. There is truth everywhere. If only our hearts were not blind and would allow our eyes to see.